Primal Defense Product Details:HSO Probiotic FormulaPrimal Defense is the only probiotic formula that contains a unique whole food blend with Homeostatic Soil Organisms (HSOs). The HSOs in Primal Defense are important probiotics you would get in abundance if your food came from soil untouched by pesticides, herbicides and other widely used chemicals. To replenish the valuable probiotics our pasteurized, irradiated and disinfected food no longer provides, Primal Defense includes 12 species of hardy beneficial microorganisms in the form of the HSO Probiotic Blend. 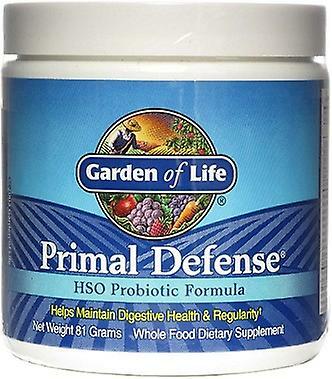 Let the unique HSOs in Primal Defense take you to a new level of total health.- The leading whole food probiotic containing Homeostatic Soil Organisms (HSOs).- The HSO Probiotic Blend in Primal Defense helps support the normal gastrointestinal balance of good and potentially harmful bacteria to help maintain a balanced, healthy internal environment. - Contains probiotics that promote regular bowel function and help maintain an already healthy immune system - both of which are beneficial to overall health. - Maximizes the benefits of a healthy diet by supporting normal absorption and assimilation of nutrients in the gut. - Unlike other probiotics, the key probiotics in Primal Defense can thrive in the toughest digestive environments and are undeterred by stomach and bile acids.- Select ingredients in Primal Defense are produced through the Garden of Life proprietary Poten-Zyme fermentation process to make nutrients more available to the body.- Primal Defense comes in two easy-to-use forms: Powder and Caplets.What are probiotics and why do I need them?Probiotics are beneficial microflora that play a critical role in maintaining good health. Healthy human intestines contain billions of both good and potentially harmful microorganisms. The good bacteria in the intestines are considered to be an integral part of normal immune system support.Probiotics are important because they can synthesize certain vitamins and short-chain fatty acids to support a healthy intestinal lining and bolster immunity. When your intestinal lining is occupied by healthy beneficial flora, it deprives unwelcome microorganisms of both space and nutrients.Healthy people usually have a ratio of approximately 85% good to 15% potentially harmful organisms in the intestinal tract. In some cases, even those who appear to be well might have an unfavorable ratio as a result of daily exposure to environmental toxins and a modern lifestyle. For example, taking antibiotics or drinking chlorinated water may change the optimal microbial balance essential for good health.Garden of Life believes that probiotics are most beneficial when they are not separated from their food source. Primal Defense, unlike isolated probiotic products, contains fermented whole foods and multiple strains of beneficial probiotics in the form of the Homeostatic Soil Organism Probiotic Blend.What are HSOs and where do they come from?Large scale use of pesticides, herbicides and other chemicals has changed the bacterial balance of the soil. In order to obtain the benefits we historically acquired from consuming foods cultivated in healthy soil, Garden of Life developed a Homeostatic Soil Organism Probiotic Blend utilizing 12 species of beneficial microorganisms.What can occur if I don't have enough beneficial bacteria?A lack of beneficial bacteria in your diet can result in an unbalanced internal environment and a lack of support for your normal immune system function. What is the difference between Primal Defense and other probiotics?Primal Defense is the only probiotic containing 12 species of hardy beneficial microorganisms in the form of the HSO Probiotic Blend. The ability of the probiotics in Primal Defense to support the normal healthy flora balance in the gut is not based solely on CFU count, but also on their ability to withstand harsh conditions in the digestive tract such as stomach acid and bile. Primal Defense also contains naturally occurring substances that function as prebiotics.If I'm healthy, how can I benefit from taking Primal Defense?Total health begins in the gut, so an optimized digestive tract has a plethora of health benefits. Primal Defense contains probiotics that support healthy gut flora balance, promote regular bowel function, and maintain a normal immune system - all of which are necessary to support overall health. The probiotics in Primal Defense maximize the benefits of a healthy diet by supporting normal absorption and assimilation of nutrients in the gut.